The U.S. Constitution is not understood. False claims are routine. Collaboration and compromise are non-existent. Inflammatory and exaggerated rhetoric the order of every day. President Donald Trump woke up in the White House unprepared for what lay ahead of him, and the country is slowly waking up to the disorder he creates. Dennis Dawson Elliott explores the chaotic path of the Trump administration in his debut publication, “Armageddon of a Different Order: Wake Up, America,” published by iUniverse. 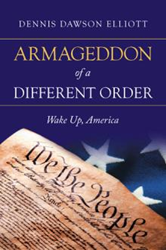 To purchase a copy of the book, visit https://www.amazon.com/Armageddon-Different-Order-Wake-America/dp/1532061994. Available at Amazon, Barnes & Noble and iUniverse. Dennis Dawson Elliott has had a distinguished career in public affairs, advertising, marketing and medical education, predominantly in the pharmaceutical industry. Elliott had a 22-year career with Bristol-Myers with his last position as director of advertising for the U.S. Pharmaceutical and Nutritional Group and he has led other media organizations. He is a retired professor from the School of Journalism at his alma mater Indiana University, with an academic focus in the fields of public relations, media ethics and business journalism. He has also conducted research on the use of cellular communication technology for HIV/AIDS education and patient management in Sub-Saharan Africa.